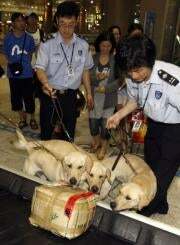 The Korean Customs Service just got six new employees: a set of Labrador Retrievers cloned from a top drug-sniffing dog. Soon, they'll be rooting out heroin smugglers, and getting a good whiff of your dirty laundry. The canine six-pack, each named "Toppy" (short for "Tomorrow's Puppy"), were cloned from a Canadian sniffer named Chaser. Three of the dogs have reported for duty at Incheon International Airport, and the rest have been placed at customs offices in South Korean cities. They showed better performances in detecting illegal drugs during the training than other naturally-born sniffer dogs that we have. No word yet on whether South Korea's glowing canine clone has similarly found employment.